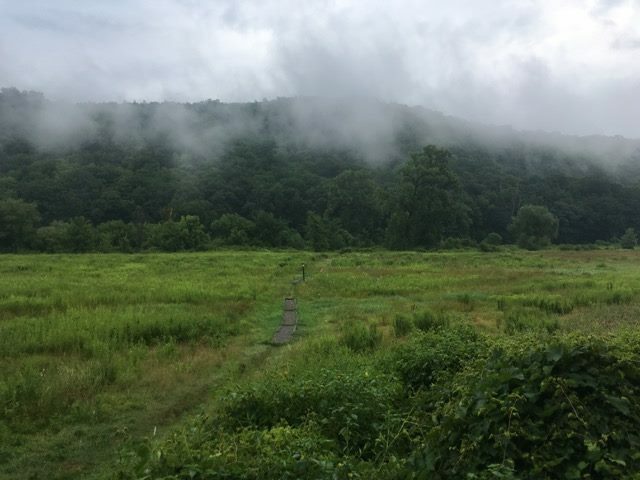 Tomorrow we leave early for another hike on the New York Appalachian Trail. 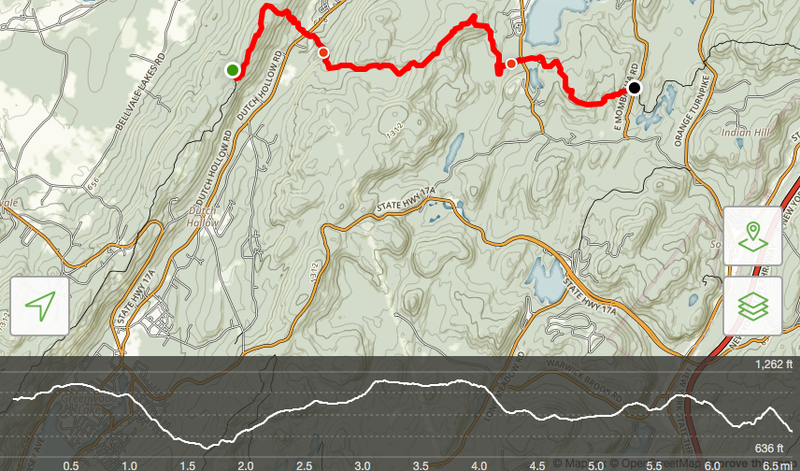 We started section 12 southbound last Saturday and slack-packed it as a warm up hike for this weekend. 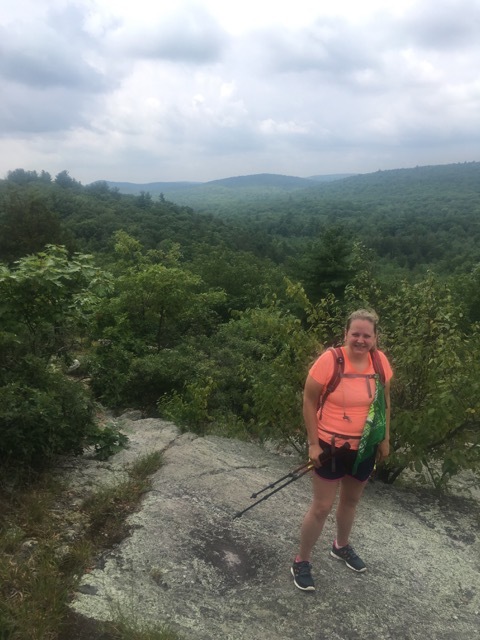 We thought about finishing all of the state in these two hikes but something about the rebar ladder up the cliff just north of the N.J. line said it to me that it was best going up that, and with a day pack vs a full weekend pack. So we will likely slack-pack that one too, to finish off our season, and the state in early fall. Last weekend the weather forecast was much like this weekend’s. Stifling heat and humidity, and chance of heavy thunderstorms. We got both of those last weekend but luckily the rain came after the hike. In this kind of heat though, rain like that can be a blessing as long as you have a way to keep dry. We are going to bring the tarp this time too, as it really saved the day in these conditions last season. There is a shelter but we don’t like to sleep in them, and it will likely be full if the weather is bad. I am hoping at the least that this means Fitzgerald Falls will be raging when we pass it tomorrow. As long as it doesn’t make the trail to precarious, I don’t mind the rain. 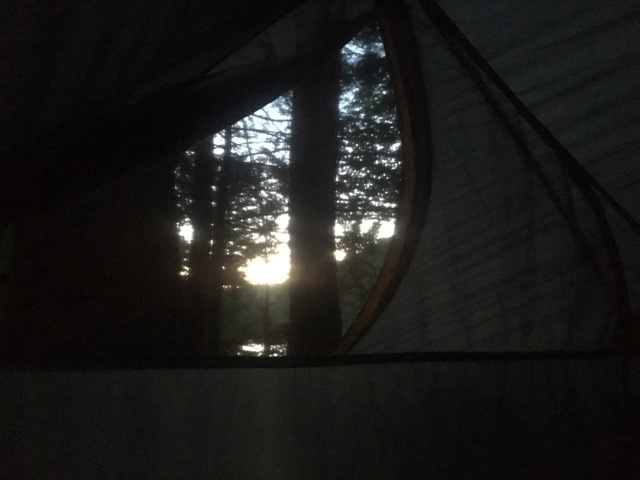 We’re just going to drive down early in the morning as we are camping out for the night, so rolling into camp at 630 won’t be a problem and we can start at 10 or 11. Fielden had such better results with her trail runners and normal socks last weekend and didnt get a single blister! 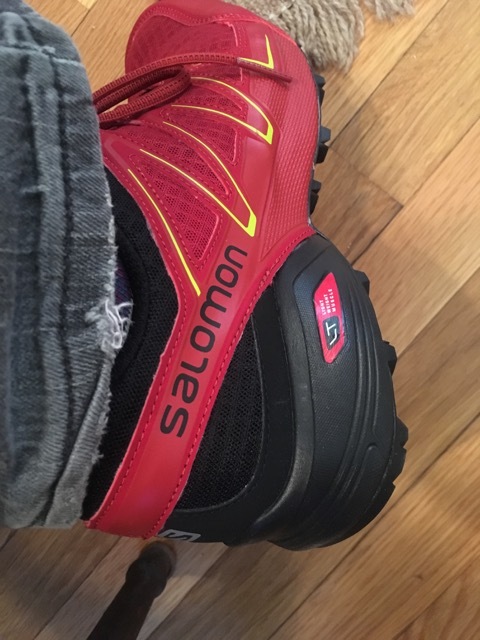 Based on this miracle, and knowing how much rockier the trail has been getting in southern New York, I ordered a pair from the REI outlet that came recommended from a friend, and they will be delivered today. I went by the store yesterday to get some more appropriate socks, and a short sleeve merino shirt. The merino really works better for me in these conditions as it wicks away the sweat a lot better, retains no odor, and dries quickly. For my chemistry I find it better than synthetics in the humid and wet summers. I have one in long sleeve but at 95 degrees heat index, I want a short sleeve. The smartwool shirts are not cheap, but every review I read, and my experience with my current longsleeve say its worth it. I love having new gear to test, and this weekend will be no exception. There are rock steps along the falls, and the rocky outcroppings of eastern pinnacles and cat rocks. I want all the traction I can get. Hopefully I won’t find the opposite to be true for me, and I load up with blisters with the new shoes and socks. 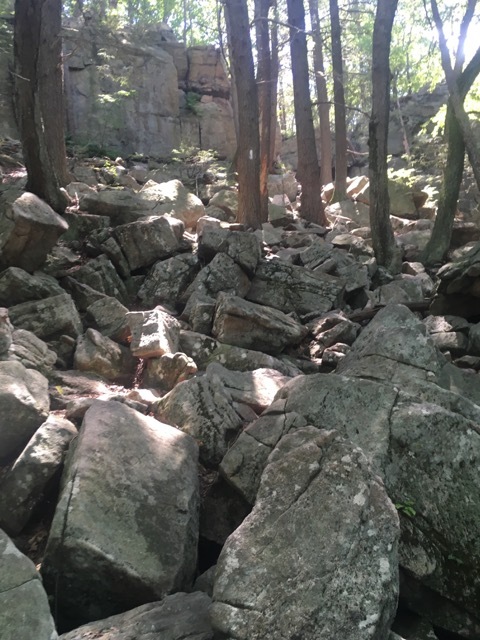 Last weekend’s section included the famous “Agony Grind”, a 500ft climb up rock piles in less than half a mile. 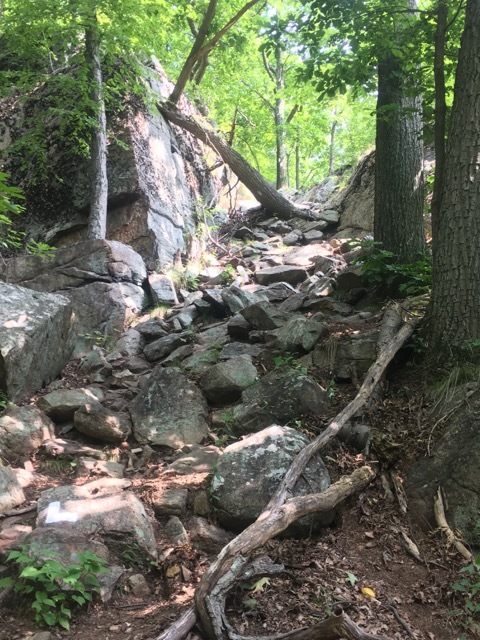 While it was steep, and very rocky, there was really no spot where you would fall long distances or heights if you slipped. I would want to do this less if it was rainy, but going slow it could still be done. We lucked out this time in that it was dry out for the moment. We stayed in Fort Montgomery the night before so we could get to the trail as early as possible, and still be back by 5 to meet other commitments. We stayed at a nice hotel and ate at a great BBQ place next door. 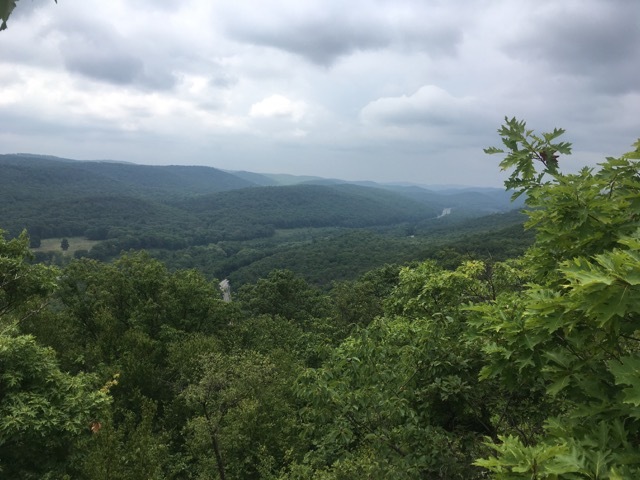 We met a West Point graduate who was headed up there shortly to celebrate his 50 year anniversary of graduation with classmates, do a presentation and then hike. He had done many parts of the A.T. in the south, and we had a nice talk about our plans. We saw they were having a Native American pow-wow at the Bear Mountain area, and since I am fascinated with that culture and collect Kachina, we wanted to make sure we had time to visit it too. And because we weren’t clear on if there was parking at our originally planned endpoint, we made the hike a little shorter that day and for tomorrow where we knew there was parking allowed. So instead of 5.4 miles we did 3.6. Still, it had many good ups and downs, and some great scenery. As we headed over the interstate from Elk Pen, a truck honked at us and I didn’t even do the arm tug! I was filming but sadly had stopped rolling at that time. 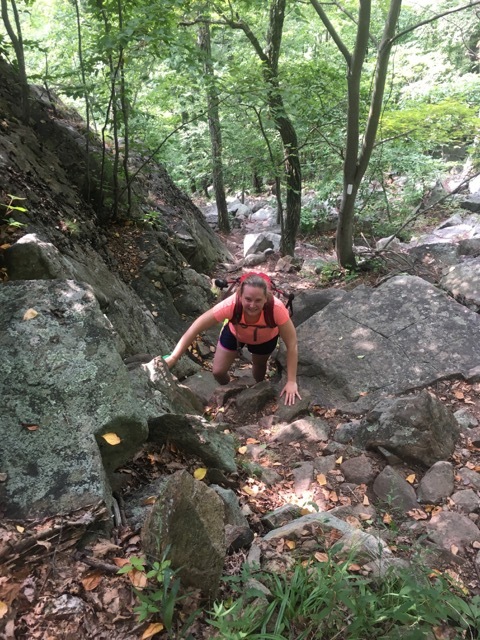 We ran across rt.17 and headed into the woods to start the climb up Arden Mountain and agony grind. Some thru hikers we saw earlier trying to get a ride into town from near here had set up their camp right by the road in the woods, clearly for this purpose. The uphill started right away, and there were about 4 different sections to ascend. Someone was set up in their hammock on the ridge by the first view, half way up. It was very pretty throughout the ascent, and we were in good spirits and enjoying it. We met some thru hikers and stopped to chat with them below the third scramble. They had just resupplied so got a late start today. As we were chatting with them and exchanging blogs and instagram accounts, we saw another group of backpackers and they joined the chat. 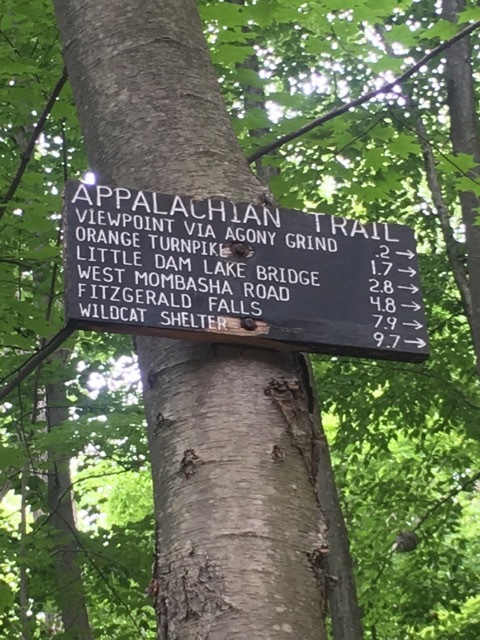 As the thru-hikers headed north (and thanked me for being a volunteer! 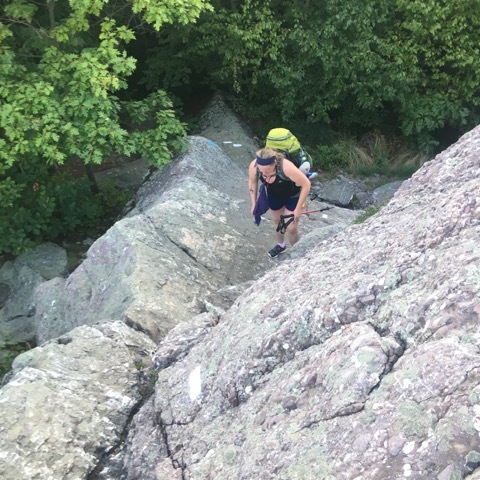 ), and I asked Fielden to get some good footage of my ascent up one of these scrambles, these southbound backpackers recognized us from when we hiked through section 10 in April! They too stayed at William Brien shelter that night. Small world. They were headed to Wildcat shelter for the night, where we are headed tomorrow. We passed each other on and off along the way and chatted each time. We told them at the last stop together that we were parked at the next road so that would probably be the last time we see them. They were finishing New York and we still had more to go. But you never know. We had a snack at the top of Arden Mountain at a trail crossing, and signed a trail register there. It apparently goes 2 miles north to the Harriman train station. 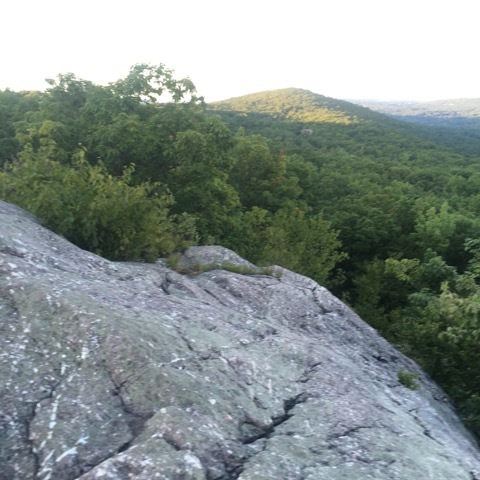 We passed a group camped on a ledge on the western side of the mountain, that the thru hikers had told us about. They didn’t seem to be backpacking as they had a fairly large campsite and lots of beer. 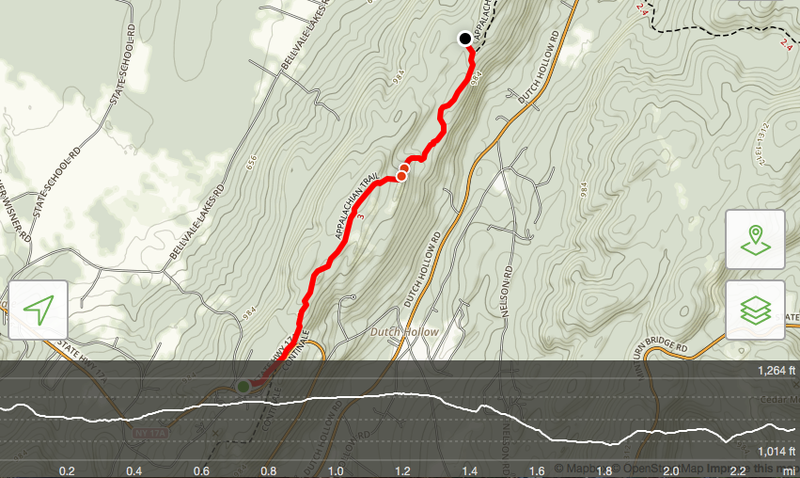 Even though its a good uphill to this site, its not too long a hike. Where we met our old friends at the last stop together on Orange Turnpike there was all sorts of trail magic, both at the bottom of the hill and the top. At the bottom there was a whole tarp / lounge setup with a trash bin, a bin of fresh fruit, water jugs, sodas, snack bars, bug spray, even athletes foot cream! There was a register book too which we signed. Our friends snapped a photo of us here before heading off. 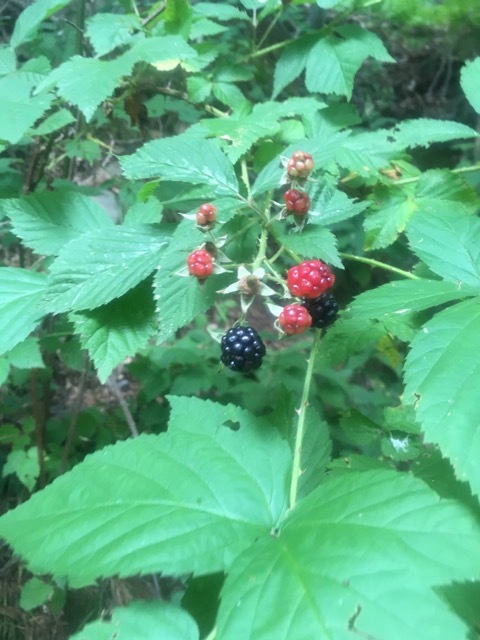 There were a few blackberry bushes and we all treated ourselves to some. I’m certain they got stuck in the storm that rolled in later, but hopefully made it to the shelter not too long after to dry off. At the top of the last short climb of the day, there was a camping area and a first aid trail magic box, full of first aid supplies! I’ve never seen that before. This uphill was a bit steep but not too long and before long we were descending to the edges of LIttle Dam lake. 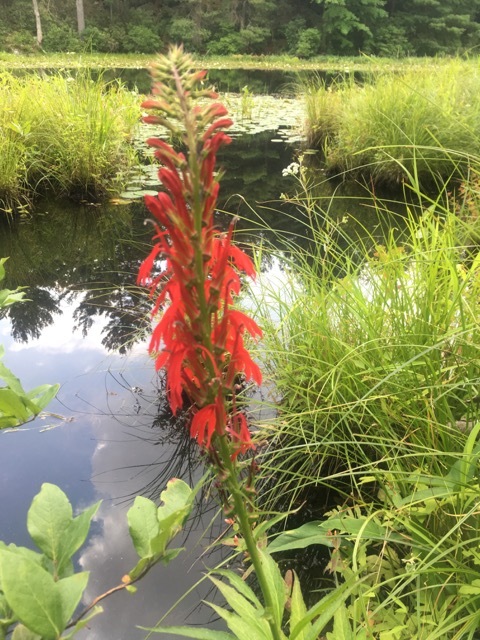 The lake was absolutely beautiful, and we spotted what I thought was Indian paintbrush but was actually cardinal flower. 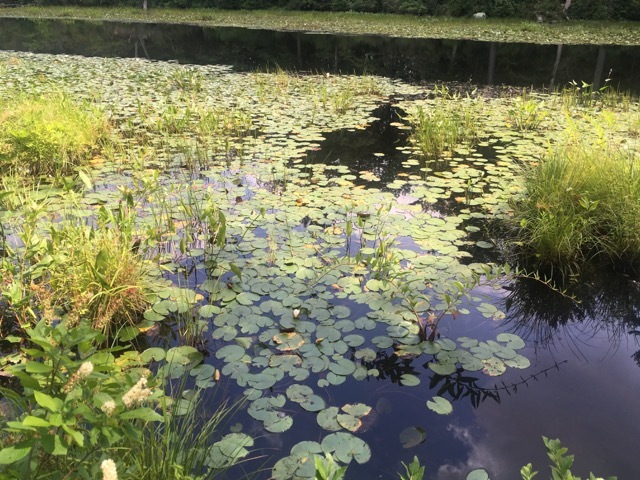 It lined the lake, which itself was full of lily pads and croaking bullfrogs. At the inlet area where you cross on stone steps, there were obvious signs of camping areas, but no signs saying it was prohibited. Though I’ve read you’re not allowed in the guide and on whiteblaze. In New York, I think the unspoken rule is you can camp where needed if you leave no trace. The cardinal flower was everywhere here and was quite beautiful. 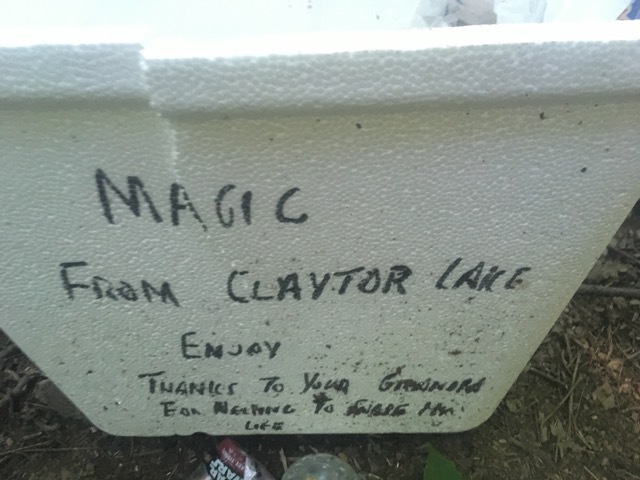 We saw another trail magic area on the way back to the road, with a couple more water jugs. I think that is great as long as the people come back and pick them up when they are empty. Its been brutal weather. 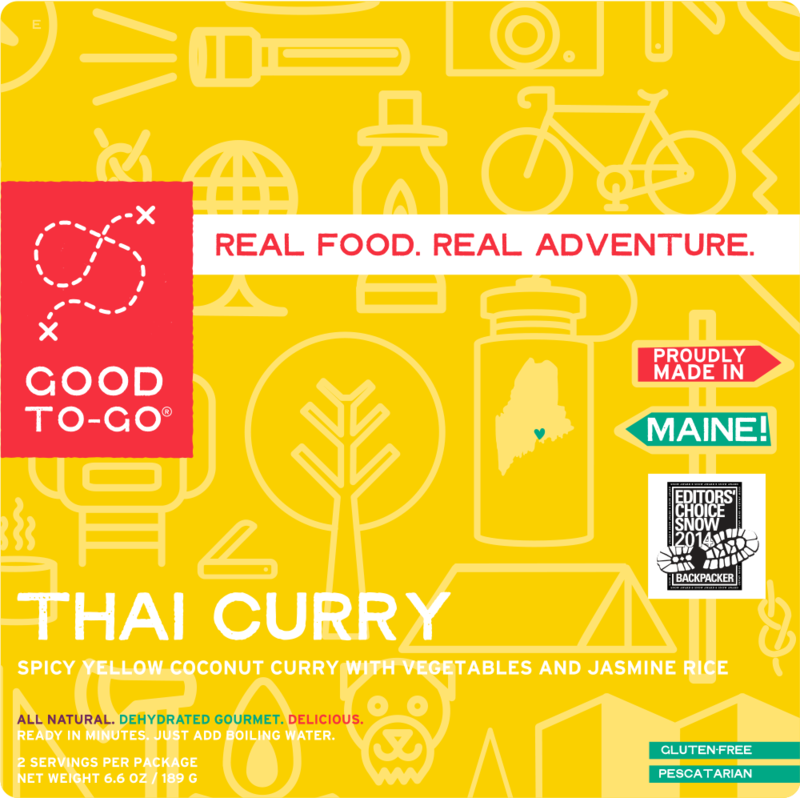 I know how much we appreciated it when we were in Massachusetts. 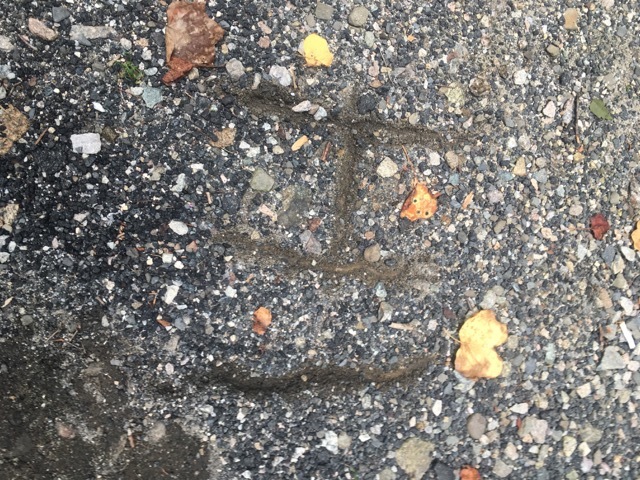 When we did get back to our car, someone had written “hi” in the dirt next to it. We were hoping it was our friends from William Brien. We gave them the blog address so guys if you’re reading this and that was you, leave a comment! On our way to get the other car at Elk Pen, we stopped at a gas station in Southfields near the trail to get some drinks and use the bathroom. Even though the gas station was state of the art and in pristine condition, they had a sign on the door that said ‘bathroom out of order, sorry use porta-potty outside.” We got our snacks and the second car and tried to find a bathroom farther up the road on the way to the pow-wow. There was a gas station with a ‘Wally-Mart” right across from the Harriman train station on rt. 17 that the blue trail leads to from the A.T. on Arden Mountain. Guess what, they said no bathrooms too. Clearly, the proximity to the trail has made these two businesses refuse to offer their bathrooms to hikers. I’m not going to pass judgement on these decisions, but I thought if you were reading this, you should know the situation and not expect that amenity at these places. We drove over to Anthony Wayne Recreation area for the pow wow. 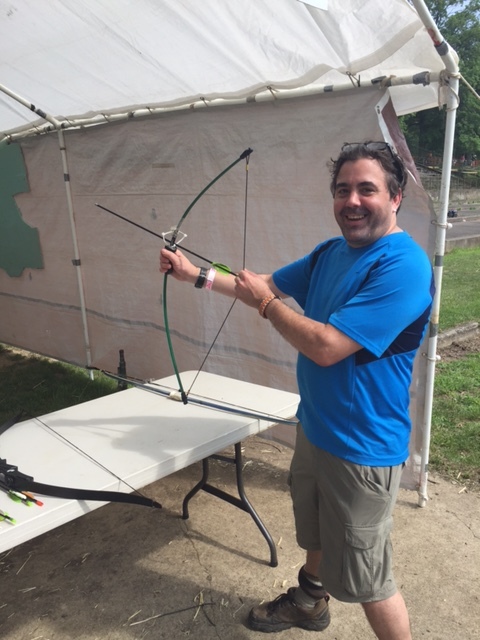 We ate Indian Fry bread, bought some momentos, watched some dances, and I got to go inside a Tee Pee and shoot a bow and arrow for the first time since summer camp. I was quite good back then and once I got comfortable with the bow, I got a near bullseye on my second attempt. I am always looking for more ways to relax and decompress in this hectic world and I found the local Y is doing adult archery courses in the fall. So I think I’m going to try the class and see if its something I enjoy doing regularly. We saw the black clouds start to roll in around 4 and headed to the car, literally as the sky opened up with torrential rain. The drive back over the Bear Mountain bridge and around Anthony’s nose in the downpour was sketchy. The road winds up and around the mountains and we could barely see out of the windshield. It didn’t last long though and before you knew it it was sunny and humid and sweltering hot again. 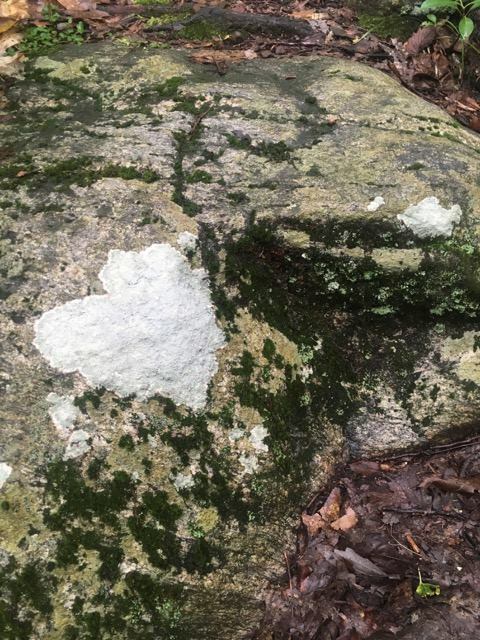 The rain never did make it to our home in Connecticut. This weekend is the famous perseid meteor shower and the display is supposed to be better than most years. I hope the skies are clear enough to see from the shelter. We will also look tonight from our deck, but we live in a small city, and its currently raining now, so its anybody’s guess if we will see anything. 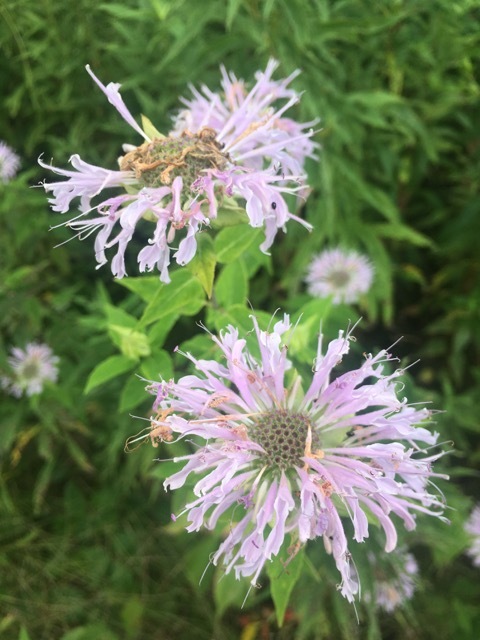 We are also excited because the Bellvale Creamery ice cream shop and the hot dog stand are right at our end point Saturday, so we plan to reward ourselves properly when we get back to the car. 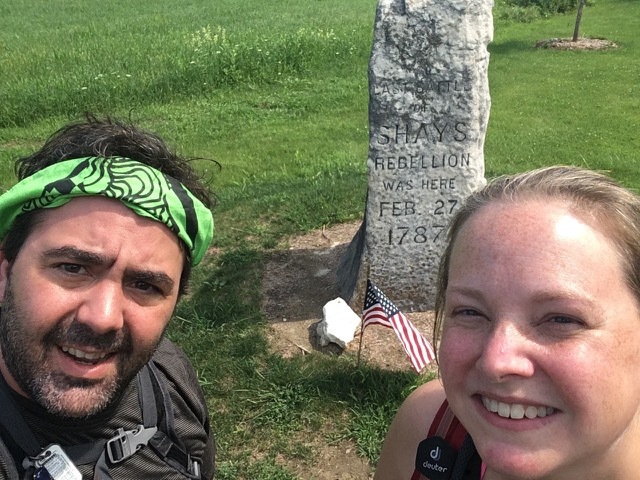 After tomorrow’s section, we have only 5 or so miles left of New York! Also, you’ve probably noticed I’m beardless now. It’s just been way too hot a summer for a fur-face! I added the recent footage to the New York video, and I can’t wait till we finish the final section and I can post the video of the whole state! Last weekend I was back up in the Kent area for another patrol hike, and for a special meeting of trail minds. Several years ago the AMC, with the support of local town officials, created a group called the Bulls Bridge task force. They monitor the historic Bulls bridge area and keep the parties out, the trails and riverbanks clean, and the people safe. Lately, larger and larger groups are attempting to come in to the area fully loaded with picnic coolers, alcohol, BBQ gear, and more. It’s not a state park and there are no bathrooms, or lifeguards, or janitors to clean up. It is a very beautiful area though so locals from near and far like to visit. This area is just .2 miles off the A.T. and while most of these big crowds aren’t coming to hike the A.T., many A.T. hikers also use the side trail through here as a shortcut to access the amenities on the road across the river. So our AMC chapter helps maintain and protect this spot as well due to its proximity to the A.T. 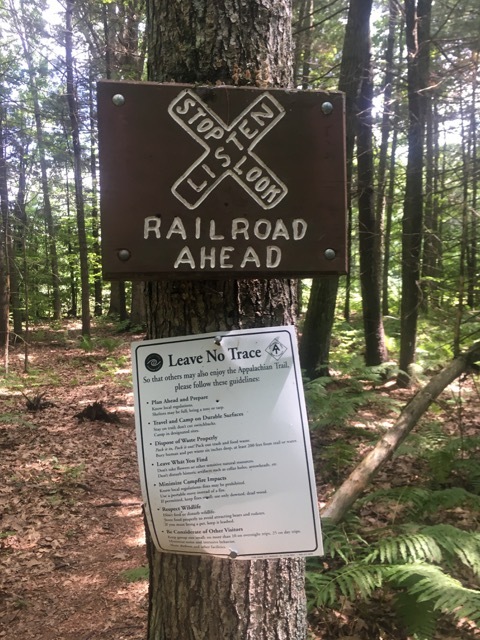 They invited me to join the meeting so I could see how the park service works with us, the towns and other maintaining clubs to keep the trail and adjacent properties safe. 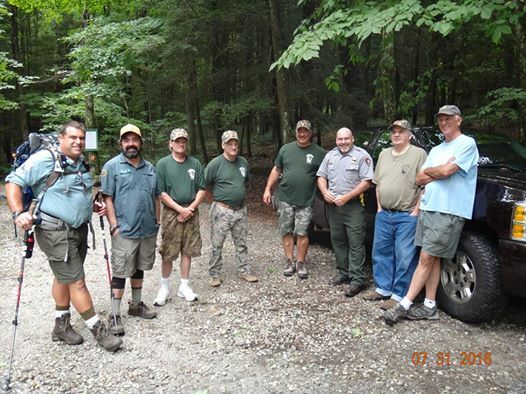 The special meeting the task force was having on this day was with the NPS ranger in charge of the A.T., and the first selectman from Kent, to address the current issues and come up with additional strategies to keep the increasing numbers of visitors manageable. I stopped by on the way to my hike to confirm the meeting time and say hello, then headed up to the trail crossing on rt 341. I passed many thru hikers walking into town to resupply, as well as several others down by the bridge when I stopped in. 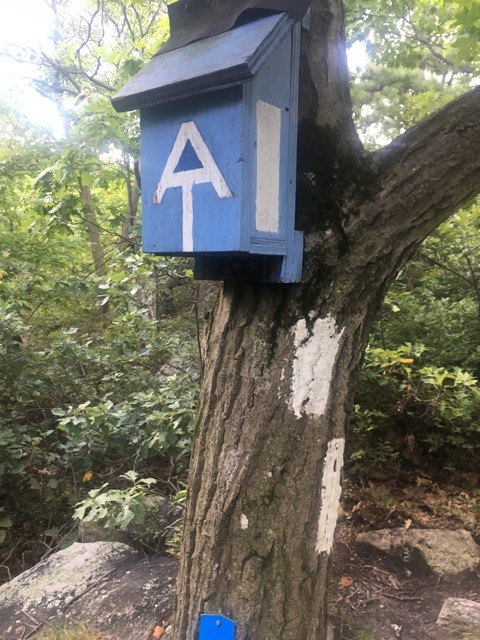 I wanted to check in at Mt. 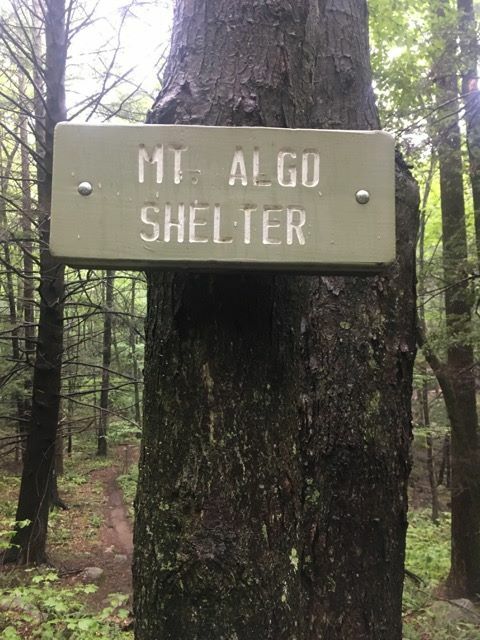 Algo shelter and see what condition the water source was in there, as well as at Thayer Brook. At last I heard the Algo brook was dry, but we had a lot of rain lately, and so I was hoping it had helped. 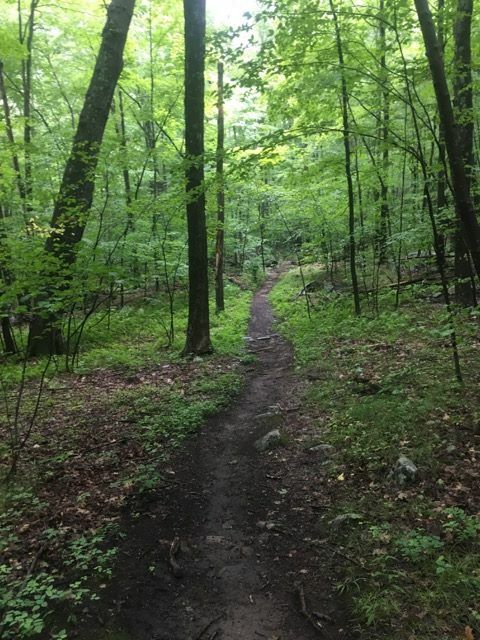 Its a fairly steep 1,000ft climb up Algo, but I had a New York section to do the following weekend with Fielden Stream with a feature called “Agony Grind,” so it seemed like a little warm-up thigh-burner was in order. The shelter is about .6 up the trail from the road, or about halfway to the summit. 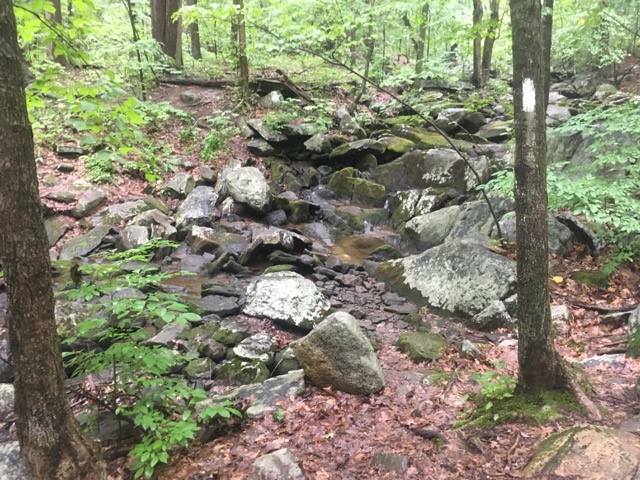 The brook is on the side trail from the A.T. to the shelter, and I was happy to see it was running again. There were several hikers in the shelter packing up. There were 2 northbound and 2 southbound hikers. 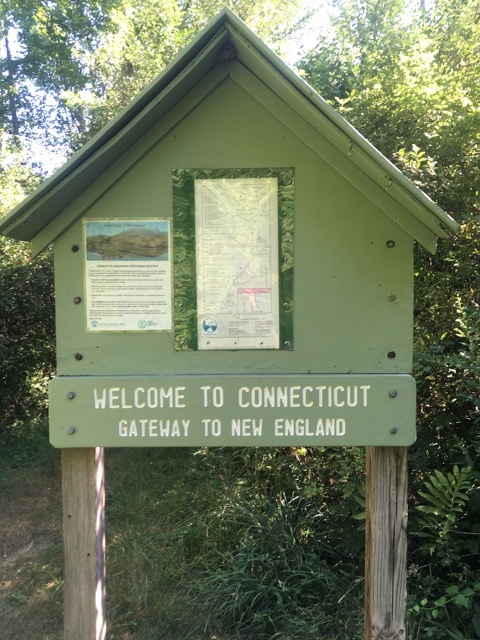 I asked them if they had any questions on town or trail resources ahead, and gladly answered them and enjoyed a brief chat about the weather and trail conditions ahead and behind. There were no fire rings to clear, so I swept the privy and signed the register. I was looking for some of the hikers I was following on YouTube but while I didn’t see them, I did see Vino’s name, who found Ninja Roll’s phone for him in Virginia. So that was kinda cool. It was steamy and sweltering hot this morning – the air was not moving at all. 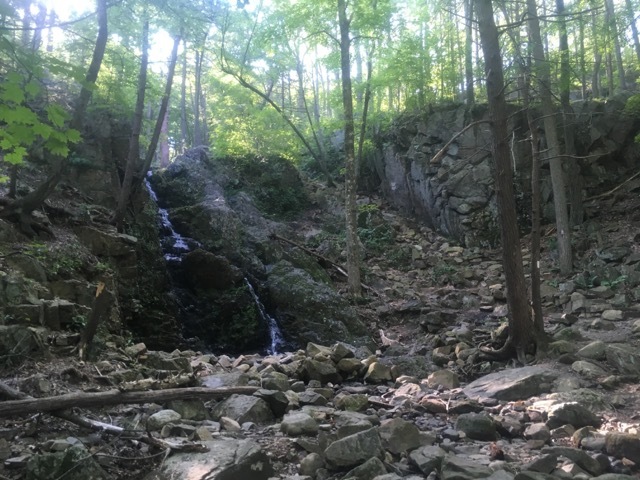 I was soaked with sweat by the time I got to the summit, so I cruised quickly down the other side to the gap where Thayer Brook sits between Mt. 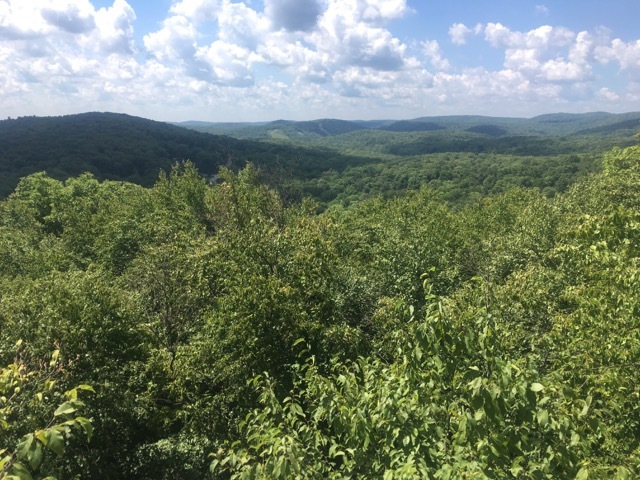 Algo and Schaghticoke Mountain. I took off my pack and cooled off and had a snack. Thayer brook was running strongly, as I suspected. I dipped my hat in the cold water of the brook before I started up again, which helped cool me down. As I left the brook to return towards my car I heard a very loud branch snap down the brook, and went into paranoia mode. All these stories of big predators in the woods by the trail lately, and my mind got the best of me. I made double time back up to the summit, and then even faster on the way down. I heard more branches snapping on the way down and imagined I was being stalked by a bear or panther! 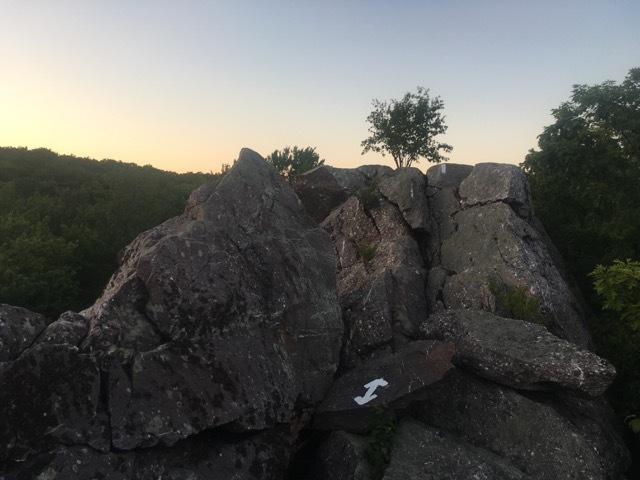 I need to stop reading so much trail gossip on the forums… soon I had a nobo thru hiker right behind me, who was very possibly responsible for the noises behind me I let freak me out. He made me laugh because not only did I realize he was probably the bear or panther, but he also said the southbounders who passed him earlier said the shelter was much closer, and I said hey well you’re here now, and there’s water! I said goodbye as he went down the shelter path and got to my car soon after. I was relieved to be back in the car and cooling off in the air conditioning. 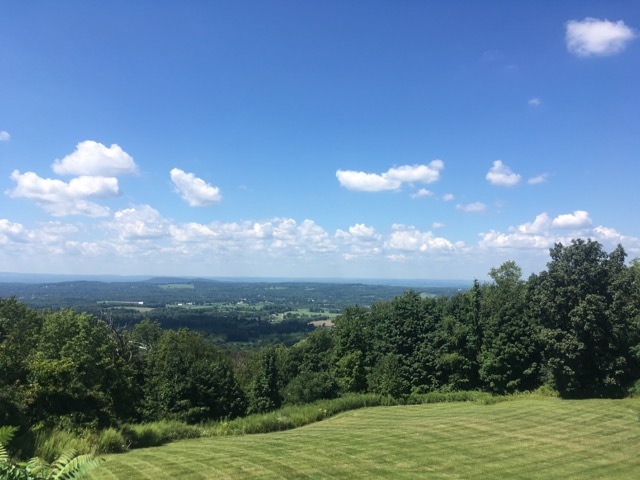 I drove down the dirt road that parallels Schaghticoke mountain back to the Bulls bridge. I passed a few more thru-hikers making their way up the section of trail that is on the road. It was great to meet the ranger and hear his vast knowledge of all things trail and his ideas and suggestions to help the group manage the surging number of visitors to the area. I felt privileged to be part of a meeting with such dedicated volunteers and our counterparts in the park service. 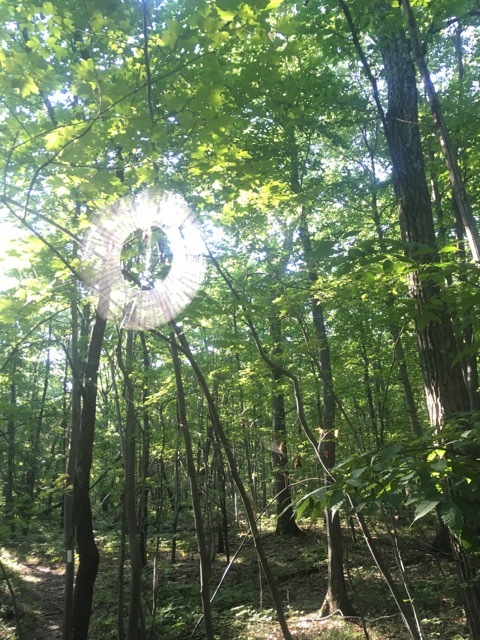 The next few weekends, Fielden Stream and I will be back in New York to work on finally finishing the state. 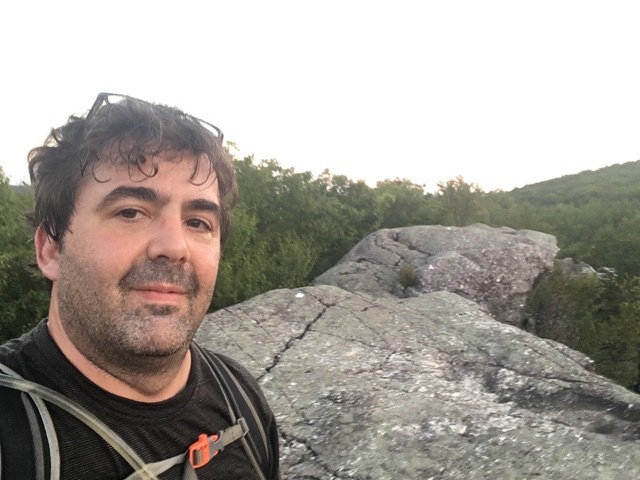 We will do it in 2 or 3 more hikes, including some day hikes, especially on the treacherous rebar ladder up the cliff on what I think is Bellvale Mountain. I want to be going UP that, and with a daypack if I can have the choice! Last weekend was sweltering hot, but that doesn’t keep the likes of me at home! 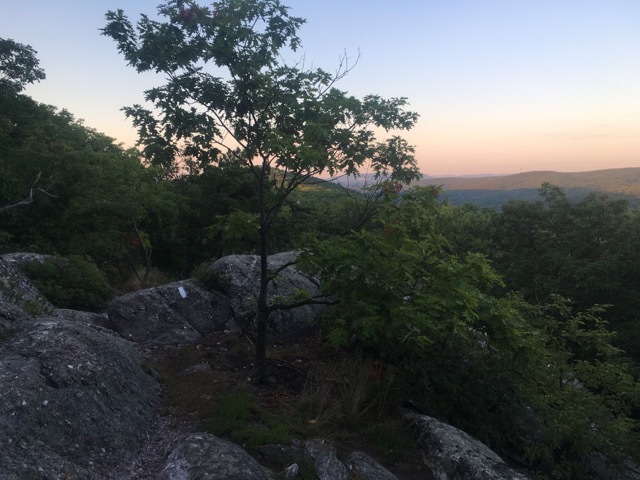 Some last minute developments changed things quite a bit, and so not only did I not hike the previous weekend originally planned, but I also moved the hike from up in Falls Village to the southern end of the Connecticut trail. It also meant I had some company this weekend, and I was basically in charge of the campsite for the night to boot. That was also good news to my ridge runner coordinators who were glad to have this popular campsite covered for the night. All the hikers were so curteous towards me, and I loved answering their questions and helping them out with whatever they needed to know. 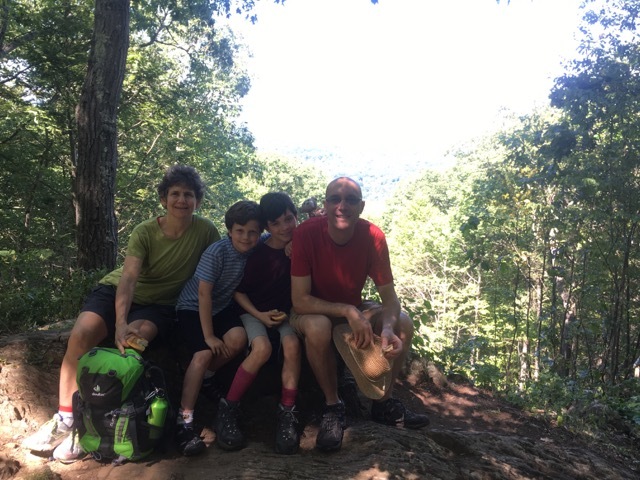 Some friends from the city were doing their first backpacking trip in a long time, and bringing their sons along on their first overnight. I truly wish Jiffy Pop could have joined for this one but he had plans with a friend, and was really excited about that too. I went through some options with them for good sections for a first adventure for the boys, and ultimately decided on this one. They were considering some New York locations but naturally I swayed them to a perfect one in Connecticut! The section had a great campground, only one climb each morning of manageable challenge, a river to splash around in when were were overheating, and a shelter, should they want to stay in one. The distance was only 2.8 miles from car to camp, and had a nice view on the summit for their reward as well. We made arrangements to meet at the trail head lot at Route 55. I started just a bit south at the New York state line, and met them at the lot just as they were unloading from the cars. I also saw our AMC crew in the lot, mowing. Having had been there a weekend or two before with my in-laws, the difference was appreciated. They would be headed to the campground we were after mowing here, but given the stifling heat they made quick work of it and were finished and gone by the time we arrived. With the kids we took our time and made sure everyone had sufficient breaks for water and rest and snacks, including a nice lunch break at the top of Ten Mile hill. We also played a game where we quizzed the boys on the fourteen states that make up the A.T. route to distract from the tough climb. The view on the top has been cleared here recently which was nice because I was worried they wouldn’t see much for all that uphill they just did. 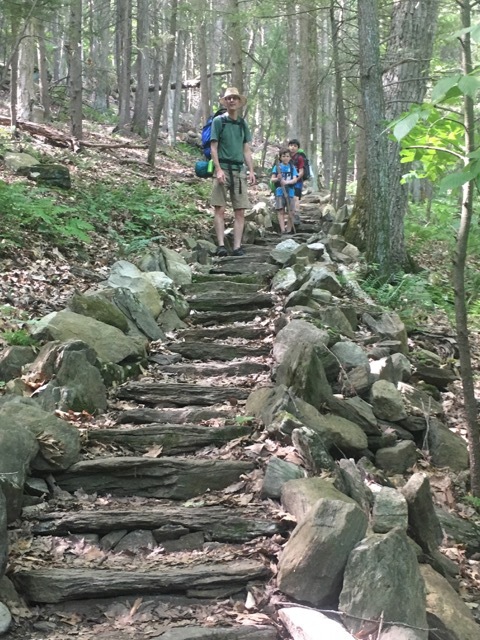 The boys set a quick pace for the descent after lunch and wandered ahead of us a bit and accidentally down a side access trail to private property that abutted the A.T. We called them back and I saw the perfect opportunity for them to learn a bit about what I do. 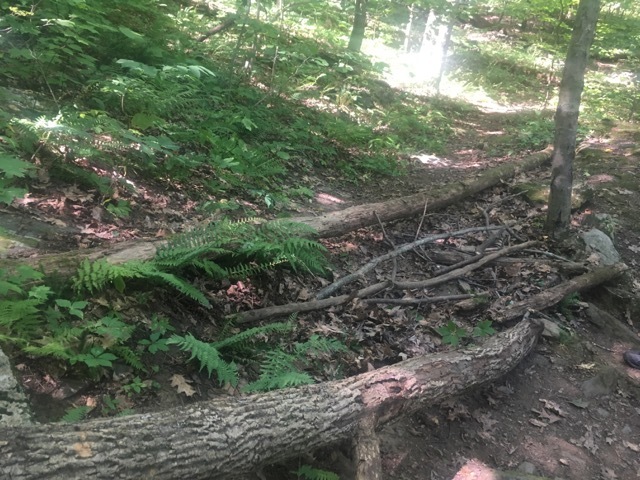 As the boundary between these two trails was obviously unclear to anyone not looking closely, I had them help me brush in the trail edge more thoroughly with logs and leaves. 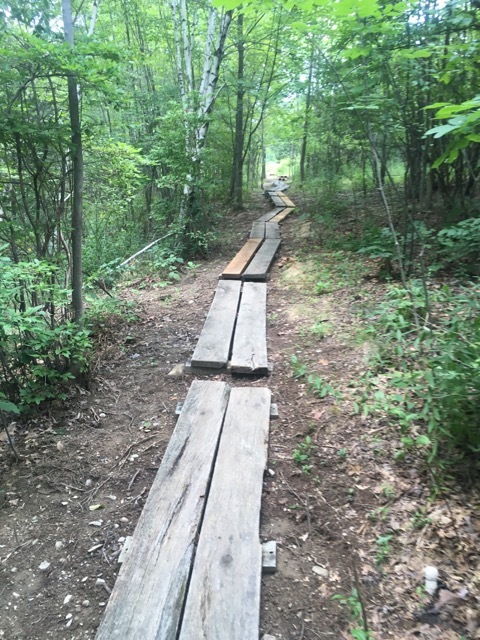 In just a few minutes, a much more defined trail edge had been born, and everyone felt good to be a part of improving the trail. We reached camp and got our tents set up by the river. Well actually my friends got there a few minutes before me, as I stopped to talk to some day hikers and section hikers and let them know about the campground amenities and the water situation north of here, should they decide to carry on (it was hot, and very tempting to stay here for the night). There were caches of water bottles left at both the Hoyt Rd and Rt. 55 lot kiosks by local trail angels, like we saw in Massachusetts the month before. 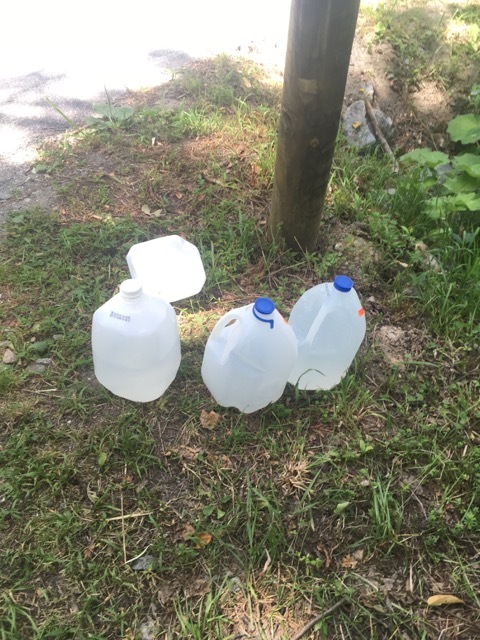 I’ve read a lot of comments on the various hiking and backpacking websites where hikers are specifically requesting water at certain road crossings, and locals obliging. 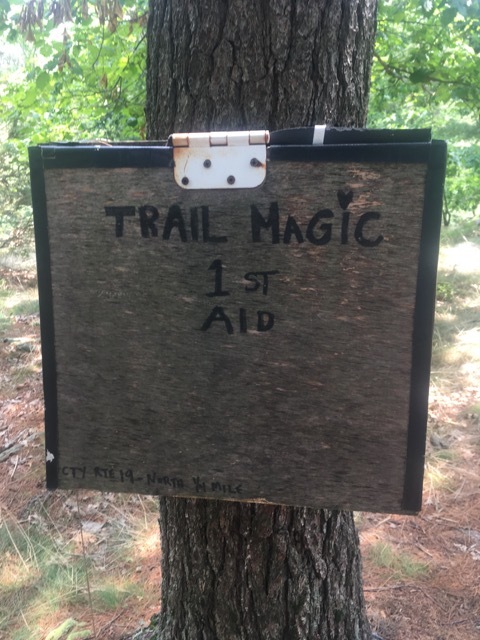 As long as the empty bottles are getting picked up later, I think this is the best kind of trail magic. Especially in these conditions. 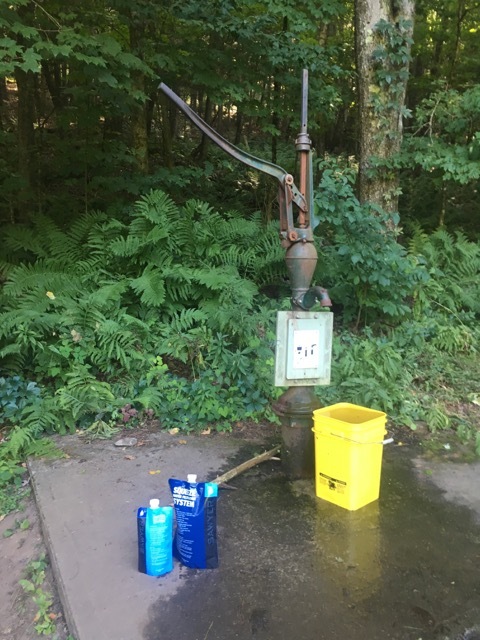 Luckily, this campsite is one of the ones that has a water pump, though you still need to filter that water. When I got to the campground I teased my friends that they took my spot, but by that I meant they found the best spot, and I set up next to them. 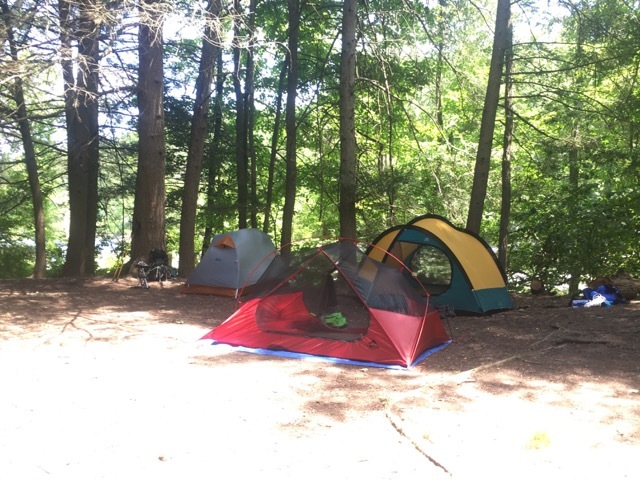 We compared notes on our tents and other gear old and new. 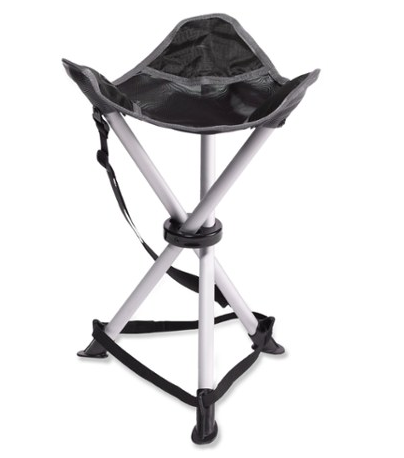 Everyone enjoyed my new accessory, the REI camp chair as much as I did as we socialized. At only $25 and 1lb 2oz, it was a luxury I could afford for a quick overnight. I don’t have the best back in the world so it was great when I needed to change into my water/camp shoes or prepare a snack. We said hello to some of the other hikers already in camp and then went to cool off in the water for a few. 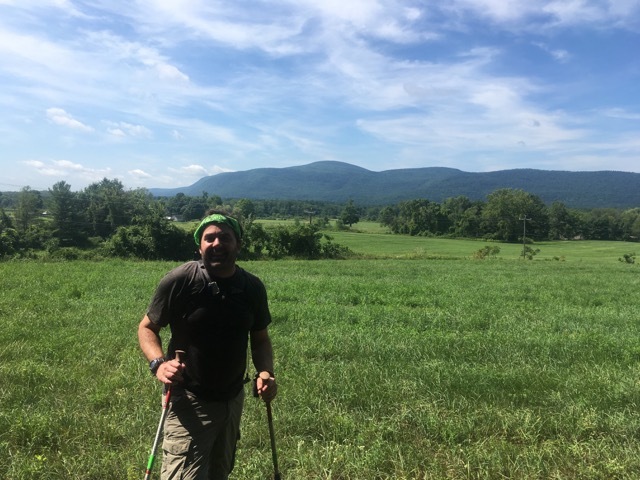 My friends in the AMC did a great job mowing the fields at the campsite, and later some hikers set up their tents on the lawn where on an earlier visit I made here the grass was 4ft tall. 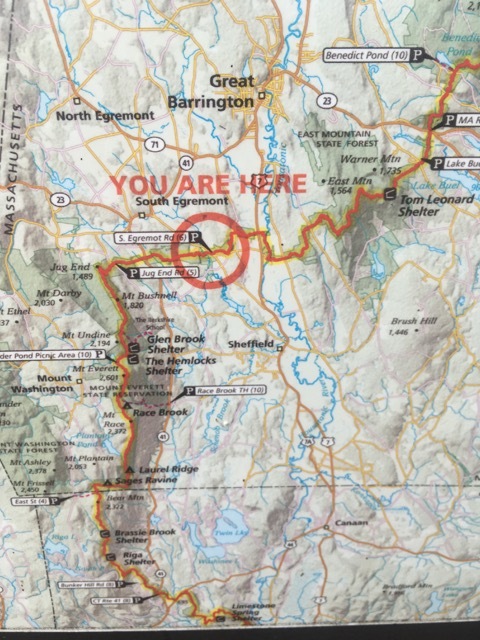 This is really when the peak thru hiker bubble passes through the area, so the timing was right. 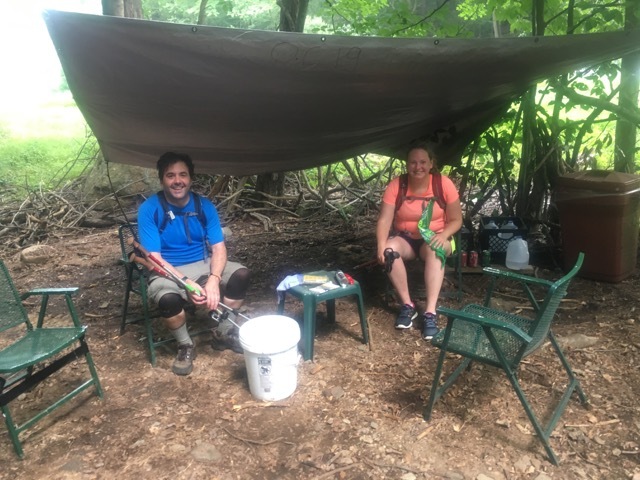 After a while I went up the trail to the Bull’s Bridge to see my friends in the maintaining club and check the other common stealth campsites along the way. 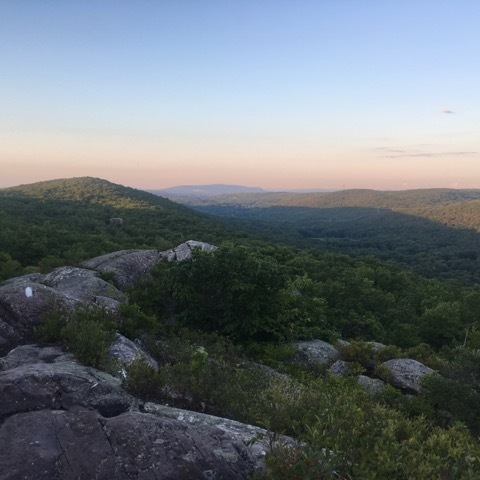 It was nice to just have my nalgene and not a heavy pack and I made quick time of the visit and hiked back with a section hiker from New Haven and showed him around the campsite. When I got back to camp my friends were still enjoying the water and I felt like it was high time to cool off myself. I spent about 30 minutes cooling off in the river and watching the crawfish pop out from the rocks by my feet and the trout swimming by in schools. I spoke to a nice man named Anthony who was from neighboring Putnam County, N.Y. who was walking his dogs and letting them cool off in the river as well. 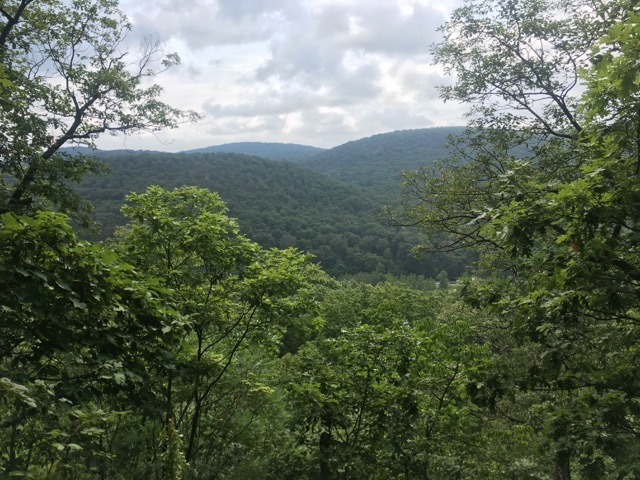 We thought we heard either an eagle or a red-tailed hawk screeching as we hiked down the mountain to camp that morning, and we heard it again as we were at the river. 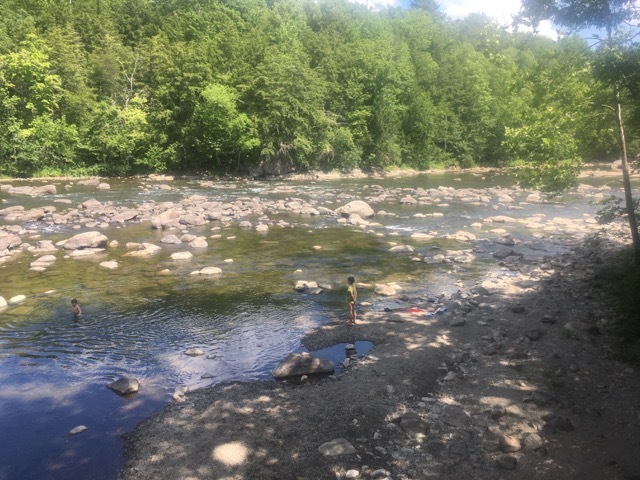 A father and daughter who had come into the campsite earlier and who were hiking from Connecticut to North Carolina (Lost Cause and Rewind) said they saw a bald eagle down river, though we did not. I’m still not sure which it was, but it was definitely a bird of prey. Rewind was 11 years old and has been hiking with her dad since she was 3. She was so curious and inquisitive and I loved how she kept coming over and asking me questions, particularly about why we have some of the rules we do here in Connecticut. I lent my new friend, Janesport, my second stove as hers had a leak, and she treated everyone to spaghetti dinner. This was a nice treat as I didn’t have to cook my dinner, and my stomach was feeling a little iffy after some bad chinese the night before. TMI, sorry. But the pasta was perfect to settle my stomach. They then went for a walk up the trail as I had recommended to check out the rapids and get some more exercise while I took a nap. When they got back we made smores and then spent some more time at the river. As sun set, we visited the Ned Anderson bridge so I could show them all the spider activity coming to life. They were just as amazed as me when I saw it on my last overnight there. We hung the bear bags and the boys came up with some imaginary theater, acting as bears trying to get to the bear bag. We hit the hay and I think I slept pretty well but I was worried I would snore a bit because I forgot my allergy meds, and they let me know I did! I hope the three hammocking across from us didn’t hear it too loudly. Our tents were pretty close which is why I think my friends heard. The next morning Janesport made everyone including Lost Cause and Rewind pancakes and I boiled my coffee and went for a walk to check out the shelter and get water after answering some questions for the thrus in for the night. As I made it up to the shelter not half awake from my coffee yet, I suddenly realized the hiker standing before me was Ninja Roll, aka Alan Craig, who we’ve been following on YouTube since he started in Georgia! I was so excited because I had missed several of the other hikers we had been following by as little as a few hours. I wish Fielden Stream had been there too, but she was excited for me. We chatted for a while about some other thrus he also knew about that we were following, and their progress. 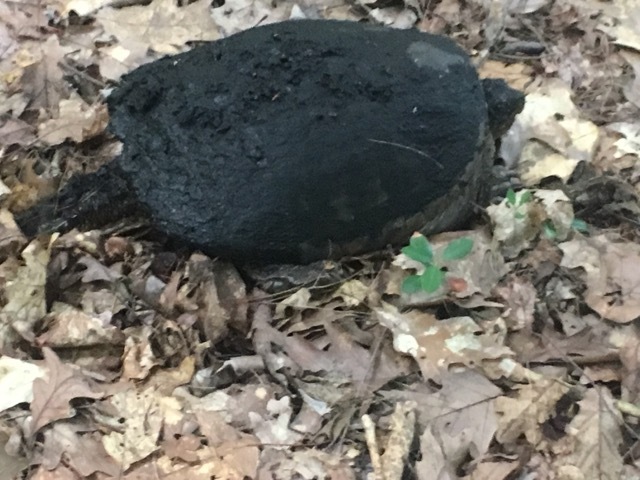 I signed the register, got a head count, and asked him to stop by the campground after he packed up so we could get a photo. I was super happy when I went back to the campsite and told my friends and asked my friend Matt to take a picture of me and Ninja Roll. A few minutes later he came by and we all spoke for a while before he headed off. 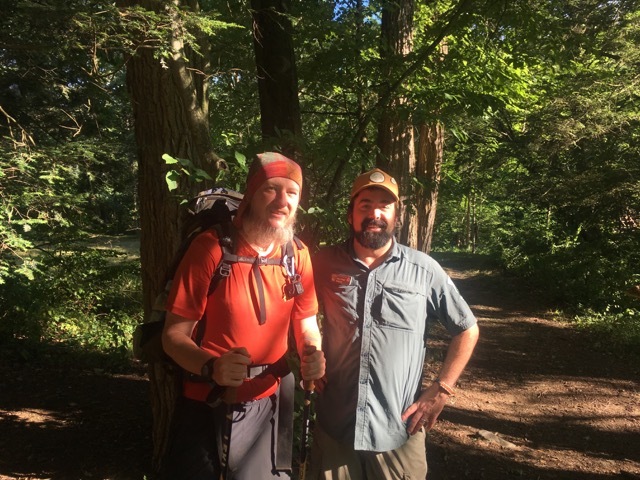 If you’re reading this Alan, great to meet you and have a great hike! We packed up our campsite and I did my notes and cleared a fire ring by the ‘beach’ while they went for one more swim. It was a little cooler now, but was heating up fast. 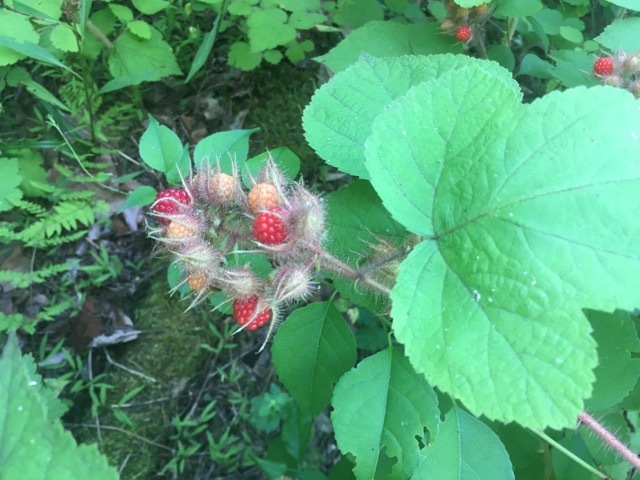 There were a few raspberry bushes and while not completely ripe, we enjoyed a few before starting up the beautiful stone stairway our club has built for hikers heading up the slope. 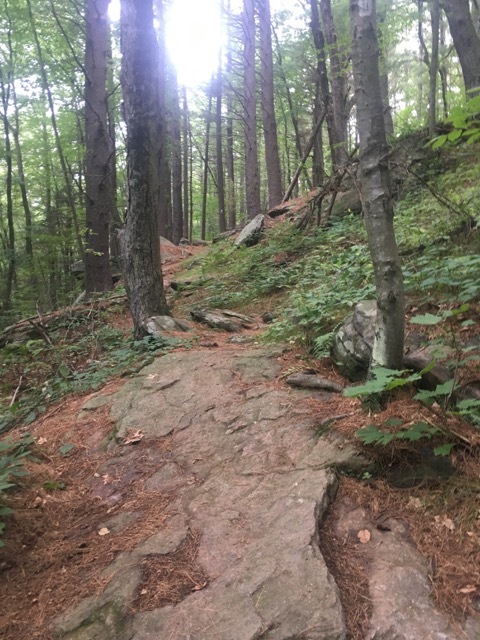 It’s a steeper and longer climb up the mountain going southbound and we made our way up, admiring our trail work from the previous day, and meeting other hikers on their way north. I gave them more advice on the water and campsite situations and they were ever greatful, as was I for being the one that could help all these hikers, including another nobo hiker named Alan. At the top we stopped for another long snack break and I split off to let my friends enjoy the rest of their journey at their own pace while I cruised down the trail to make it back home for my own kids midday. 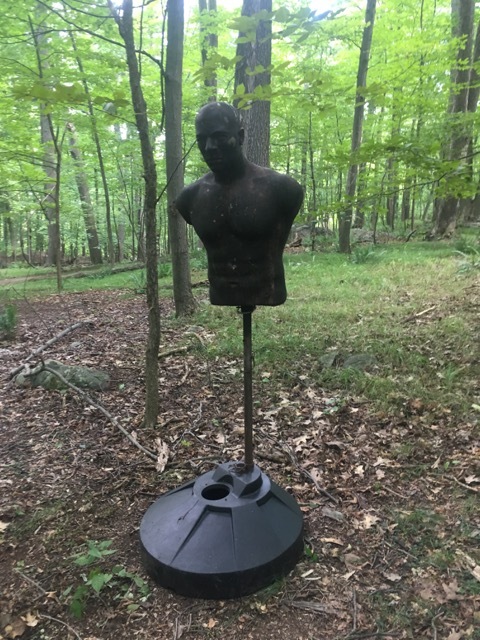 I stopped on the way home to find some dining room chairs for the new house and Fielden Stream came up the next day to look at them while I was at work. 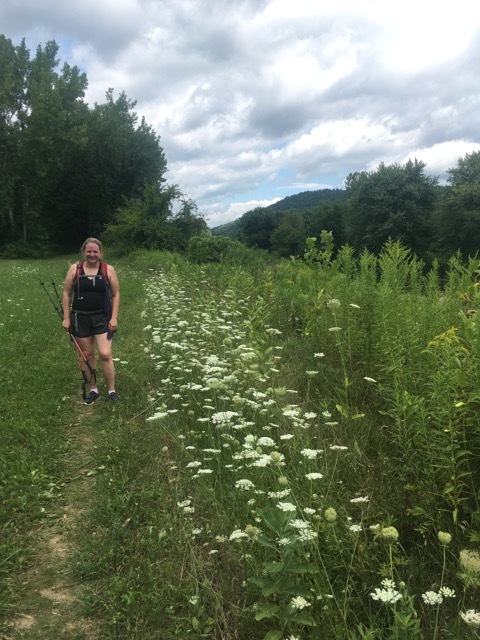 She picked up a few thru hikers who had zeroed in town the night before and they got talking about the trail, and eventually me and my volunteering. She mentioned that I was out at Ten Mile the night before and coincidentally it was the three hammockers across from us at the campground that weekend. Small world. 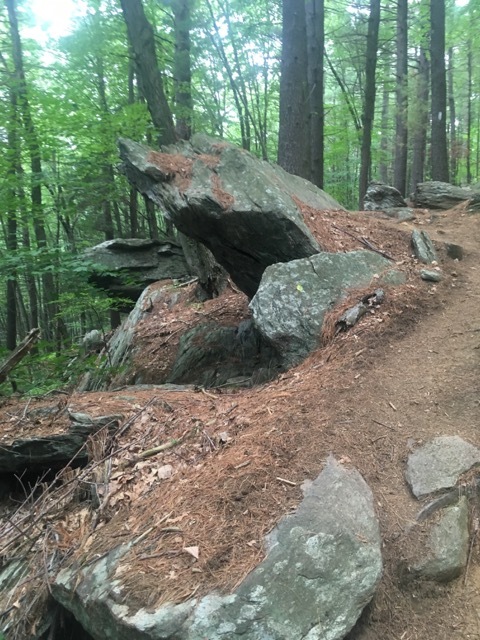 Trail Karma, whatever you call it. It was cool for all of us.